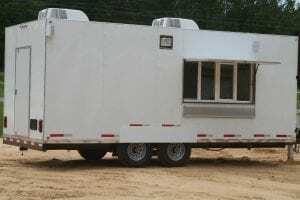 At Russell Concession, we don’t think you should have to compromise when using a mobile kitchen. All too often, businesses assume that they have to make do with whatever they’re able to fit into a trailer. 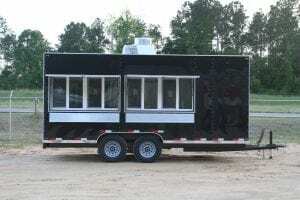 With a custom-designed mobile kitchen by Russell Concession, you can have a trailer that’s not just equal to a brick-and-mortar kitchen, but one that’s actually superior. This isn’t wishful thinking, and you don’t have to take our word for it. For more than a quarter of a century, we’ve been designing and manufacturing mobile kitchens that exceed our clients’ expectations at every turn. 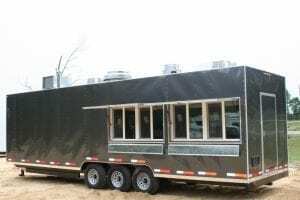 Many trailer suppliers treat mobile kitchens as cookie-cutter solutions and expect their clients to change and adapt to make their designs work. It shouldn’t be that way, and with Hurricane Concession, it’s not. 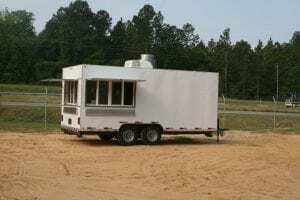 You shouldn’t have to change the way you do business in order to make do with a mobile kitchen. Instead, your mobile kitchen should be crafted in a way that makes your preferred methods more efficient and effective. 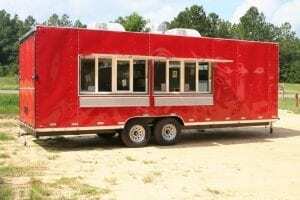 Food trucks are exploding in popularity, but you can’t hope to stay on top of the trend without the right tools. You have plenty of choices when it comes to buying a mobile kitchen. Shouldn’t you choose a company that has a proven track record of success? 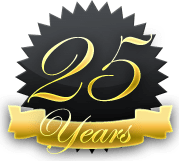 Russell Concession has been designing and manufacturing custom trailers for more than 25 years. During that time, we’ve continually kept up with the latest innovations and have constantly been on the lookout for new and exciting ways to thrill our clients. One of our most important innovations is the collaborative way in which we design our mobile kitchens. By bringing clients into the act, we’re able to achieve things that no other trailer supplier can. While shopping around for a new mobile kitchen, you’re sure to run into the term “standard unit” a lot. Some manufacturers use this term like it’s a positive thing, but nothing could be further from the truth. Every professional chef has his or her own way of doing things. Each restaurant has its own unique flair. Expecting any restaurant or chef to be content with a standard array of features simply isn’t practical. For this reason and many others, Russell Concession doesn’t manufacture standard units. 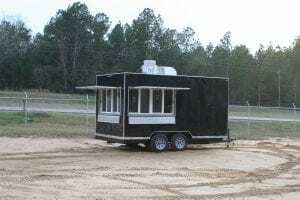 Every mobile kitchen we build is completely customized to ensure the utmost quality and utility. 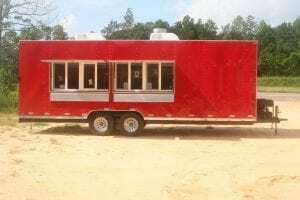 What are you looking for in a mobile kitchen? Before assuming that your wish list includes things that just aren’t possible, be sure to talk to us. Many of the mobile kitchens we design include fairly standard features like stovetops, fryers, grills, coolers and kettles. 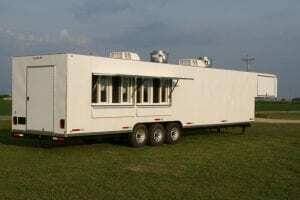 We’ve also manufactured numerous mobile kitchens with much more surprising and useful features. 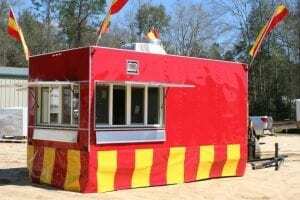 Which features will make your food truck the biggest success? From 40-gallon tilt skillets to walk-in freezers, the sky’s the limit. Just tell us what you need, and we’ll get you there. At Russell Concession, we’re all about collaboration. 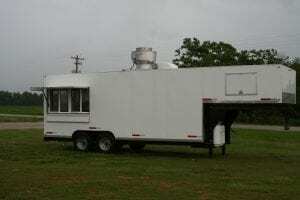 Our team will work directly with you to ensure that your custom mobile kitchen has everything you need. Because we include you so closely in the process, we are able to keep costs remarkably low. 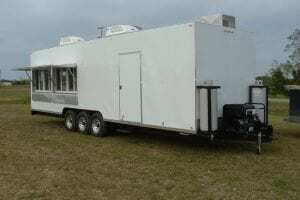 Therefore, don’t rule out a custom-designed trailer due to concerns about cost. You may be pleasantly surprised by just how affordable it is. Whether you have blueprints that you want us to use or just want to come up with a design with our talented team, our collaboration is sure to produce great things. 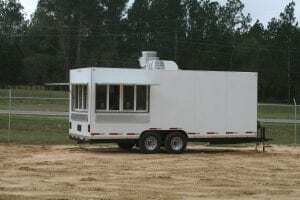 Buying standard mobile kitchens and food trucks is like trying to fit a square peg into a round hole. No matter how you try to do it, you’re going to get short-changed in some way. Why settle for less? 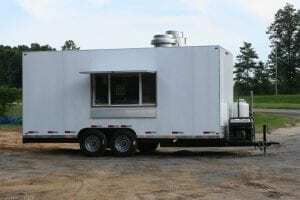 By working with the experienced professionals at Russell Concession, you can get a mobile kitchen that helps you achieve every last one of your goals. In order to run a successful and profitable business, you need to arm yourself with the right tools. 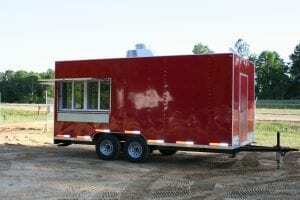 A custom mobile kitchen by Russell Concession is the best of the best, so contact us now to get started.